It looks like in 2016, Agricola had an urgent wish for children. First came the revised edition, and now the standalone Family Edition, a streamlined version of the larger game that plays in under an hour. But does it retain enough of the spark from the original game, or is it streamlined away? Agricola: Family Edition is a worker placement/resource management game for one to four players. Players are farmers building up their farming infrastructure while also having to feed their families. The player with the most points wins. 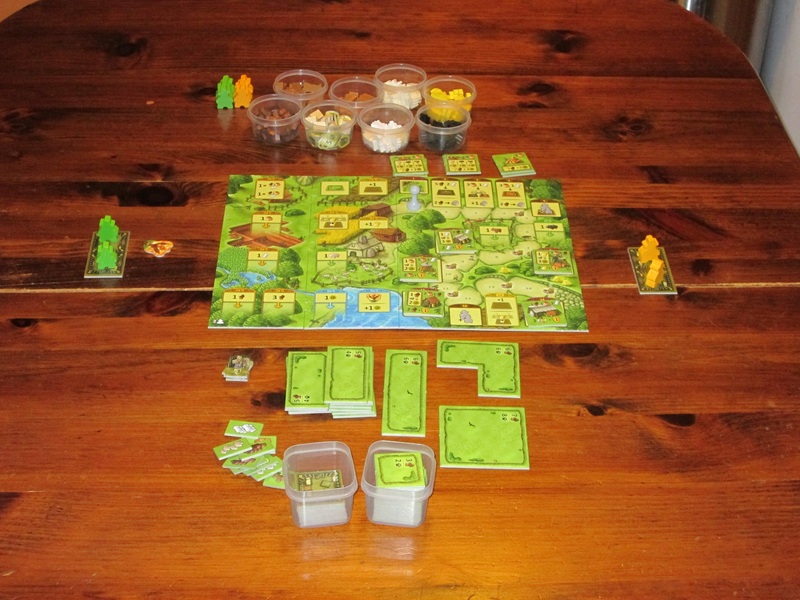 Agricola: Family Edition set up for two. 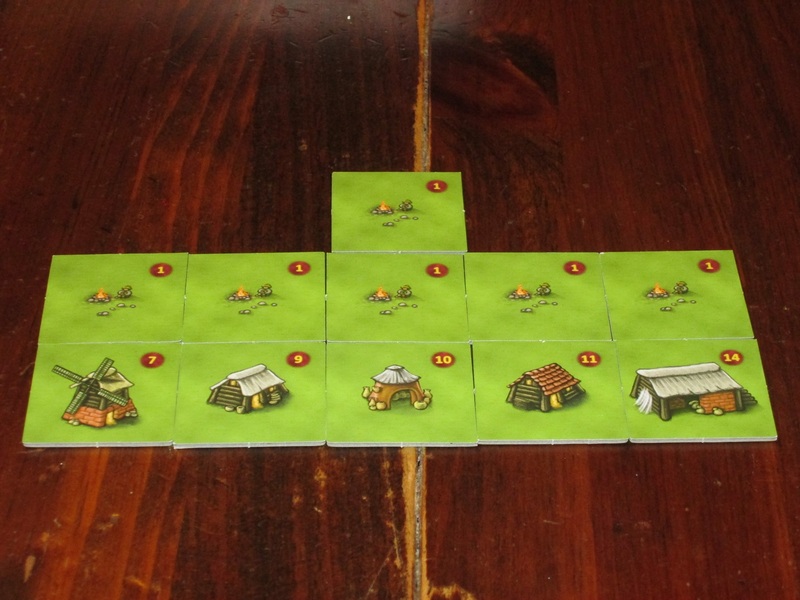 To begin, each player chooses a color and receives two farmers of that color and a two-room wooden house for the farmers to live in. A start player is determined, and players receive starting food. 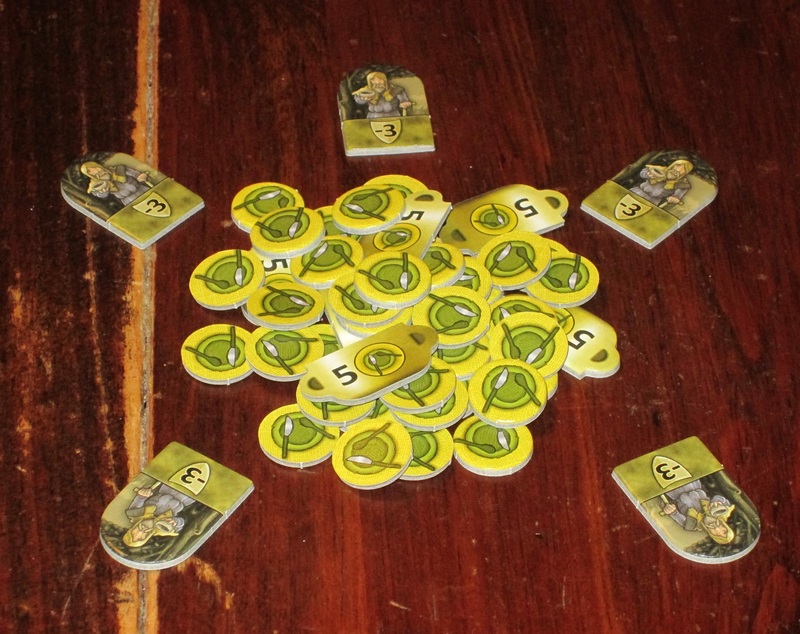 To begin each round, the round tracker pawn is moved along the road one space, and all resource gathering spaces receive resources. Beginning with the start player, each player places one farmer on an action space and takes that action. Once a farmer is placed on a space, no other players may take that action this round. Once each player has placed all of their farmers, the farmers return home. At each harvest, players have to feed each member of their family or go begging. But really, just feed your family. At the end of certain rounds, there is a harvest. Harvests have three phases: field (remove sown grain from a field), feed (pay 2 food for each farmer), and breed (each 2+ group of animals produces one new animal). Each round, one new action space opens up, and as the game progresses, new resources and new possibilities open to the players. Players will be doing things like plowing land, planting grain, building fences and stables to house animals, adding on to their houses, and improving their farms. At the end of fourteen rounds, there is one final harvest, and players count their points. They receive 1 point for every field, pasture, clay house room, improvement, animal, planted grain, and fenced stable. They also receive bonus points for any improvement tiles they have. The player with the most points wins. Improvements are available throughout the game. On the back of each tile, it tells in which round that improvement will become available. USDA Choice, or Mystery Meat? Agricola is the first heavy game I played on entering the hobby, and it retains a special place in my heart. But even with the full game, I wasn’t always in the mood to play with the cards. The cards open up a lot of decision space, and my mind wasn’t always in the mood to make those decisions. 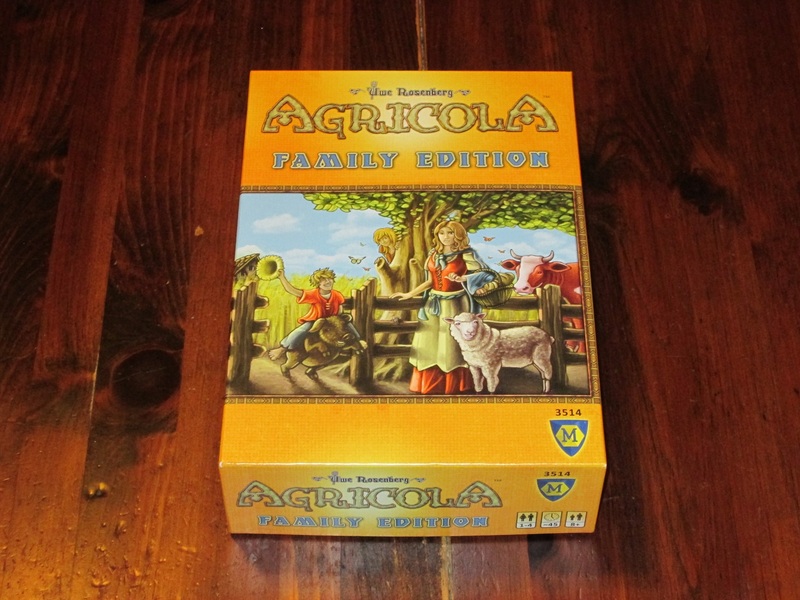 The full game originally came with a “family mode,” which was essentially the game without the cards, but Mayfair Games has now released a separate Family Edition of Agricola. 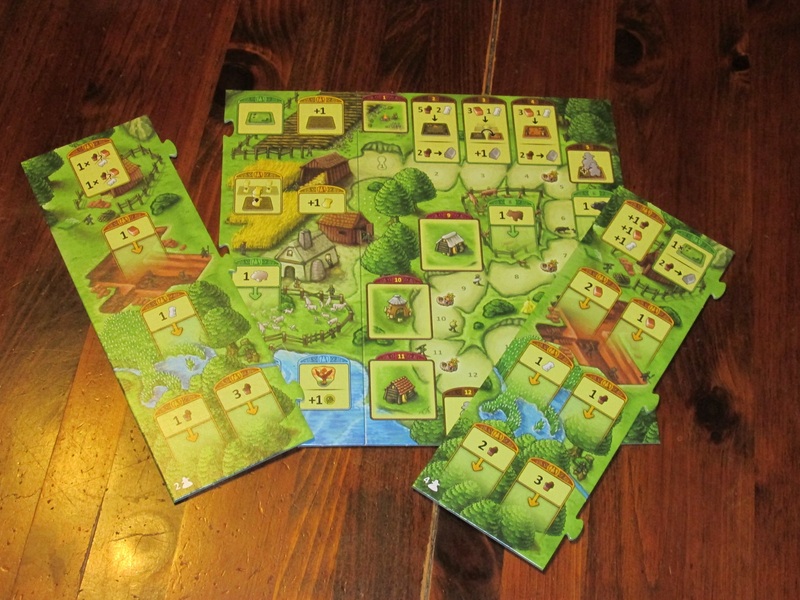 Agricola: Family Edition is more than just Agricola without the cards. 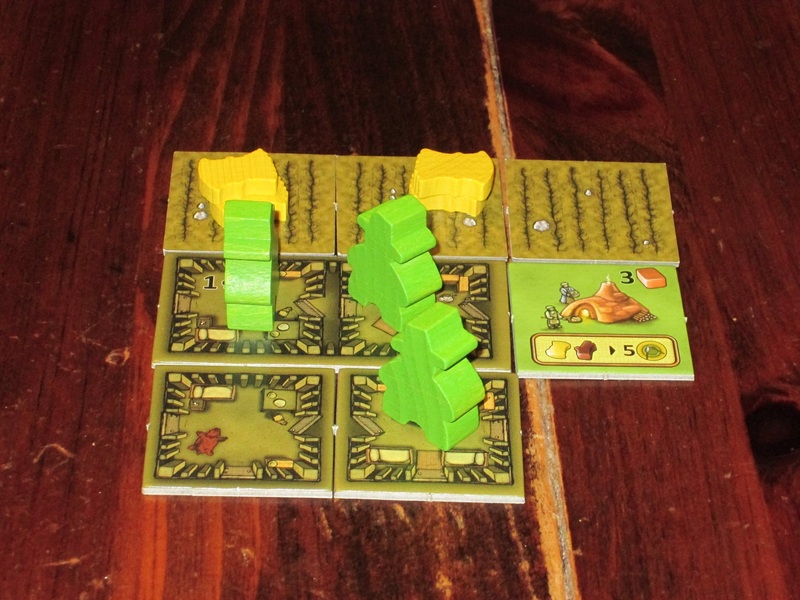 It streamlines and simplifies some things while retaining much of the core of what makes Agricola great. The result is a very good family game that should be a hit with many audiences. 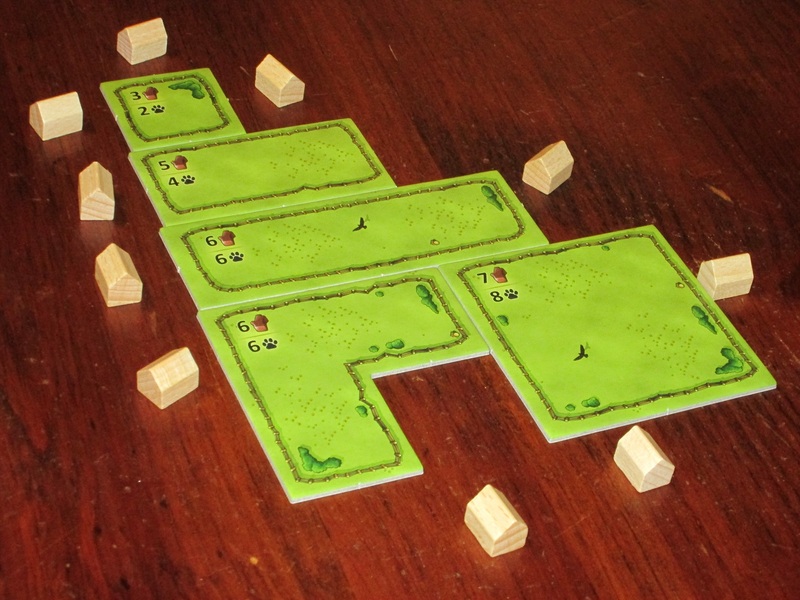 Unlike the full Agricola game, in the Family Edition, pastures of various sizes can be built and added to your farm just by paying the price indicated. This makes things much simpler. The main tension in the game is balancing efficiency with necessity. Each player begins the game with just two actions each round, and every action is precious. This pushes players toward efficiency: many spaces allow you to maximize actions. You can build as many rooms or stables as you want, or as many pastures, or you can plant up to three grain for one action. But you must–must, must, must–feed your family at every harvest. The penalty of three points for every food not provided is too great to pull you away from this main task. (While the game provides beggar tokens for each food you can’t provide, really, these serve more as guardrails than a viable strategy.) So while you want to do as much as you can in a single action, you can’t gather strength each round until you are ready to build everything you want to build in one go. You are necessarily returned to the main path. Feed your family! The first player marker can be very important, especially if the wood (or any other resource) has been allowed to pile up, or if you have to make sure you get the action you need. While this tension causes the main point of conflict in the game, it also provides the source of the fun. Spaces on the board are limited, and you’ve got other players getting in your way. The more other players are in the game, the less chance you have of getting the action you want. 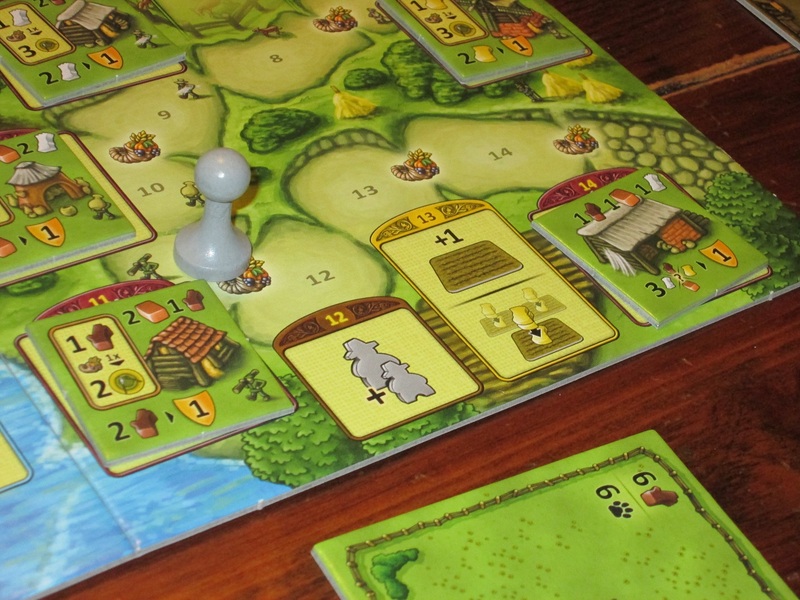 Agricola was one of the early innovators in the worker placement genre, and its decree that each spot can hold a single worker is carried over to the family-friendly edition. Once one player claims a spot, no one else can. No exceptions! This affects the tension of Agricola’s system of resource accumulation: many of the spaces not chosen will just get more and more resources placed on them, making them more attractive the longer they’re ignored. This makes taking the start player token (a cardboard rooster) an appealing proposition. Turn order doesn’t pass naturally from round to round; it has to be wrested from another player by claiming an action space. It can seem like a waste of a turn to do so…until you realize that the wood you need to build your house is never going to accumulate for you unless you seize it first, and you need to go first so someone else doesn’t take the action space you need. Knowing when to nab the start player token is another fun tension in the game. Sometimes you really do need to go first. My farm at the end of a solo game. So much stuff! It’s very rewarding to see what you’ve built at the end of the game. I was a little worried about the longevity of Agricola: Family Edition when I opened the box. Nothing changes in the setup in each game, and players have full and open information of everything in the game. While this may seem like a recipe for predetermined play, I’ve found each game to be unique and engaging. Sure, you can try the same strategy from game to game, but Agricola is very interactive, and chances are if the other players see you pressing the same lever again and again, they will cut off your access to that lever. Further, what seems attractive one game may be less so in another one. The order in which you choose your actions, the willingness of other players to allow resources to pile up, and when you claim your third action are huge game changers, and you don’t have absolute control over any of this in the multiplayer game. So even though setup is the same from game to game, replayability is high, especially since there are several avenues for scoring points. Having children in Agricola is nigh essential, as that is how you will gain more actions. I love the jigsaw board with a different supplement to plug in depending on the number of players. The components here are outstanding. 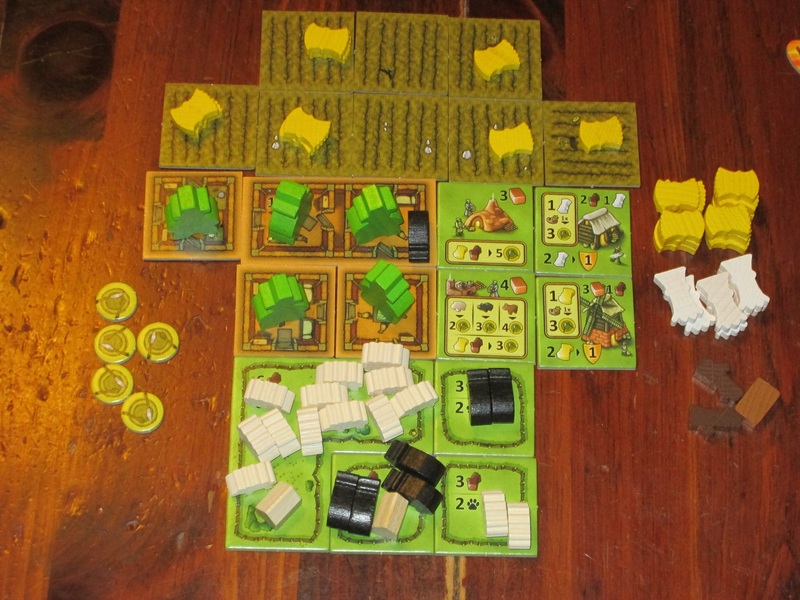 The wooden bits are the same high-quality bits in the standard Agricola game. They are shaped and substantial. The tiles are double-sided and on thick cardboard. The board has a jigsaw outer edge, allowing you to plug in the board that fits with the correct number of players (and the game scales to all multiplayer counts). The art and graphic design on each piece is clear and nearly flawless: it’s easy to see the icons, and the icons explain what each thing does. I do wish the harvest symbol along the turn track were clearer, but that’s a quibble. You’re getting a well-built game for the price. The rules are 12 pages but with lots of pictures and explanatory bubbles from Uwe Rosenberg. Not too hard to learn from. 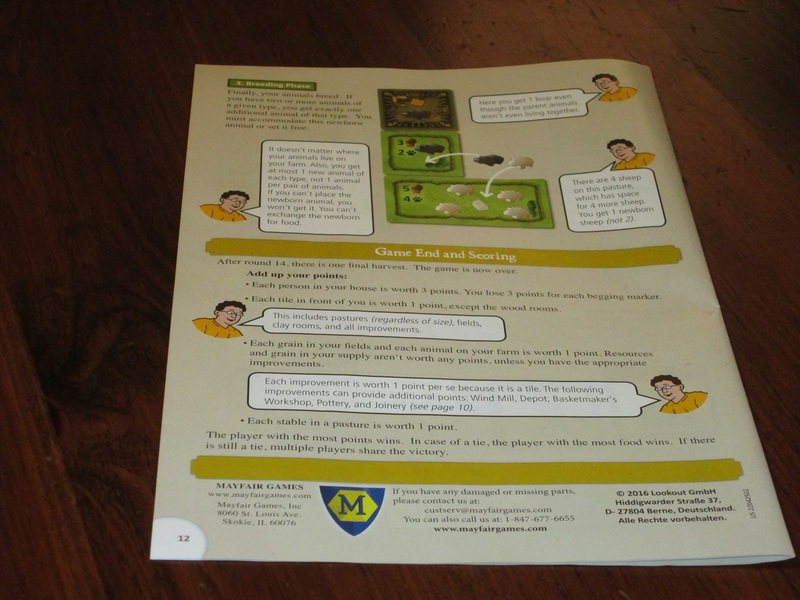 The rules of Agricola: Family Edition are 12 pages, more than your typical game aimed at families. 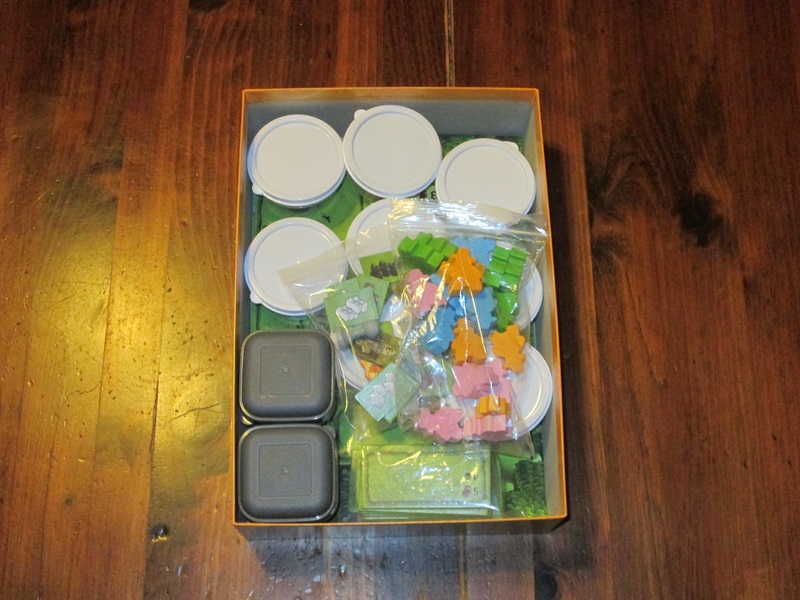 But the rules are mostly intuitive, especially given how closely the game hews to its farming theme, and since spaces open up as the game progresses, you can explain the game as you play, allowing strategies to form on subsequent plays. The rules are clear, and there are lots of illustrations and explanatory bubbles throughout (an illustrated Uwe Rosenberg is your guide), so as long as someone is comfortable reading rules, the game should be easy to pick up. The iconography is also excellent, which will help players to remember the rules while they play, and players are generally drawn in by the familiar theme in a illustrated lightheartedly. There are, however, some edge cases that can be easy to forget in a rules explanation–it might be best to consider the first game with new players as a learning game. I’m not a huge fan of the worker placement genre, but for families, I think this is a great choice. I like it much better than the dry and soulless Lords of Waterdeep, and it’s significantly shorter than Stone Age (although in my experience, non-hobbyists love Stone Age). The action spaces get more efficient as the game goes along. For players who already know, love, and own Agricola, I’m not sure Agricola: Family Edition offers enough that’s distinct to own this game too. Even the new edition of Agricola includes rules to play without the cards, and while the Family Edition is a faster and simpler game than even Agricola without the cards (and it’s not possible, really, to import these streamlined features of the Family Edition to the full game), the cardless variant of Agricola works similarly enough that it’s probably not worth buying this edition. If, however, you don’t own Agricola, the Family Edition isn’t a bad buy, especially if you find the card selection in the full game disorienting. For one thing, it’s cheaper, and it’s surprisingly approachable compared to the full game. Aside from removing the cards, there are lots of places where scoring is simplified and rules complexities are streamlined. (For example, it no longer takes an action to bake bread, nor do players have to spend several moments rearranging fences or counting and recounting their wood every time they make a pasture, nor do they have to manage stone as yet another resource.) 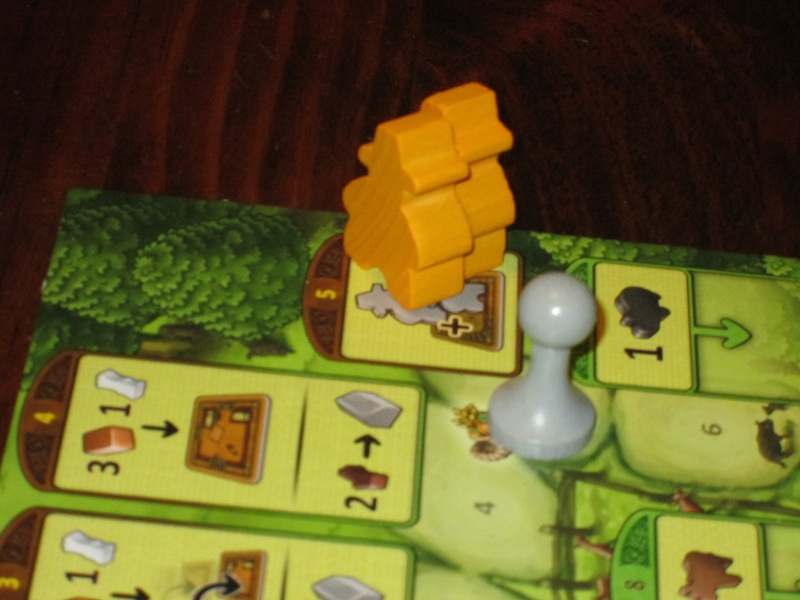 Yet even with this streamlining, it still feels like Agricola and has the fun tension of the full game–you must feed your family–in a fraction of the time. (Although if solo mode is important to you, I wouldn’t get the Family Edition. There are no differences from game to game, and no special solo rules included, so once you discover the optimal strategy, the game loses its interest.) The game consistently finishes in the 45m to 1h mark, even with new players. If I were to give Agricola as a gift, this is the edition I would give without hesitation. Agricola: Family Edition, like its ancestor, includes lots of plastic bags. to store the pieces. And like its ancestor, I’ve sprung for my own solution (in this case, baby food containers from the dollar store). The only thing I really miss from the full game is Agricola’s necessity to diversify. (The tagline “Monoculture is boring!” on the back of the Family Edition is betrayed by the gameplay, which in no way rewards diversification.) But there is something to be said for the wide-open simplicity of the Family Edition’s scoring system, so I don’t miss this too much. My only hope for the game is that the publisher will release small tile expansions, similar to Agricola: All Creatures Big and Small, that will inject some variety into the game. Even limited additional variety would give this version the edge for me over full Agricola in this stage of my life, where large blocks of uninterrupted free time are rare. I really enjoy Agricola: Family Edition and think it’s a great streamlining of the full game, and beyond this, a fun game in its own right. While I like Agricola’s cards, they add a huge time (and brain) investment, making it a game I have to prepare for in advance in order to play. They also limit the field of who will be interested in it. The Family Edition is short and simple enough to appeal to a wide range of players while remaining deep enough to provide compelling decisions. It is, in short, an ideal family game. 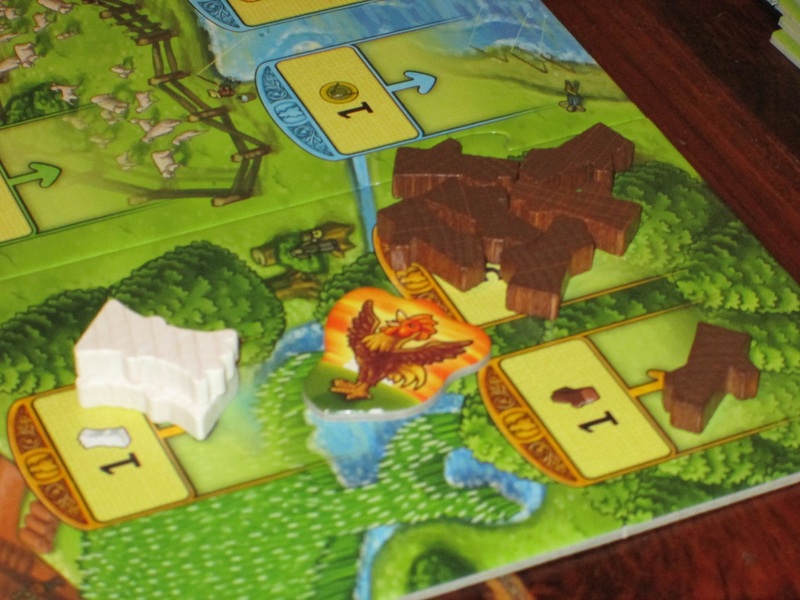 iSlaytheDragon would like to thank Mayfair Games for providing us with a copy of Agricola: Family Edition for review.